Taylor Downing remembers Stuart Cooper’s ground-breaking 1975 World War II film. Using a combination of archive footage from WWII and feature footage, Overlord captures the essence of the war with chilling realism. Stuart Cooper’s film Overlord (1975) is the only feature film ever produced by the Imperial War Museum. While the museum has worked closely with many television companies on documentary productions over the decades, Overlord uses the museum’s resources in the production of a drama-documentary intended for cinema distribution. The film tells the story of a young recruit conscripted into the British army in 1941 who is slowly turned into a soldier and who then trains for D-Day, becoming a cog in a great machine of war. As the day of the invasion approaches he has a repeated premonition of his death. The film interweaves its central narrative performed by suitably young actors with genuine archive film of the preparations for D-Day. This creates an extraordinarily realistic portrayal of the run up to the greatest amphibious military operation of all time. However, the origins of the film lay with a completely different project altogether. In the late 1960s Lord Dulverton of the rich Wills tobacco family, commissioned a vast Tapestry of the 1944 invasion of northern France. It was intended as a sort of Bayeux Tapestry in reverse, and was to be finished by the 13th anniversary of D-Day in 1974. The Overlord Embroidery, as it became known, told the story of the build-up to D-Day in 34 panels. The Imperial War Museum (IWM) became involved in the project and James Quinn, one of the Trustees of the museum, commissioned a young film-maker named Stuart Cooper to make a documentary about the making of the Tapestry, using authentic archive film alongside the work of the embroiderers. As the project developed, however, it was clear that there was going to be nowhere large or suitable enough in the IWM to display the work which came out as the longest embroidery in the world at 272 feet – 33 feet longer than the Bayeux Tapestry. However, discussions between James Quinn and Stuart Cooper developed into an idea to use the original archive film that had been viewed and copied as the backdrop to a newly written narrative of the build-up to D-Day. Quinn had been director of the British Film Institute from 1955 to 1964 and had helped to set up the National Film Theatre on the South Bank and to establish the London Film Festival in 1957. He had also encouraged the making of short experimental films. After leaving the BFI, Quinn set up the Paris Pullman in South Kensington, a cinema which showed first-run arthouse movies. He helped to pioneer the independent cinema chains that have become so popular today. When the Director of the IWM at the time, Dr Noble Frankland, heard of the idea to expand the original documentary about the tapestry into a more ambitious feature film he rather surprisingly gave the thumbs up. The IWM was already deeply involved in the production of The World at War, the classic 26-part television series being produced by Jeremy Isaacs for Thames Television. IWM staff members were working closely with the programme makers in finding archive footage and in advising on content. The feature film project was seen as a cinematic parallel to this big television series. Frankland had helped to re-invent the IWM since becoming director in the early 1960s and to turn it from a rather stuffy museum full of glass cases of uniforms and models, into a modern outward-looking establishment committed to promoting a deeper understanding of war. Frankland now used his contacts with the Ministry of Defence to provide top level support for the making of the film. The army provided a squad of young recruits to appear alongside the actors; the Royal Marines provided further extras and a couple of landing assault craft of the type used in 1944; the RAF provided a rare, flying Lancaster bomber for some of the air scenes; and the Royal Navy provided a helicopter from its airbase at Yeovilton to film aerial shots. Overlord was a combined operation in every sense. Leaving the comfort of his middleclass life, Tom is thrown into a world of authority and aggressive drill sergeants. The film begins, as does the Embroidery, with German troops marching into France in 1940 and aerial footage of occupied Paris. 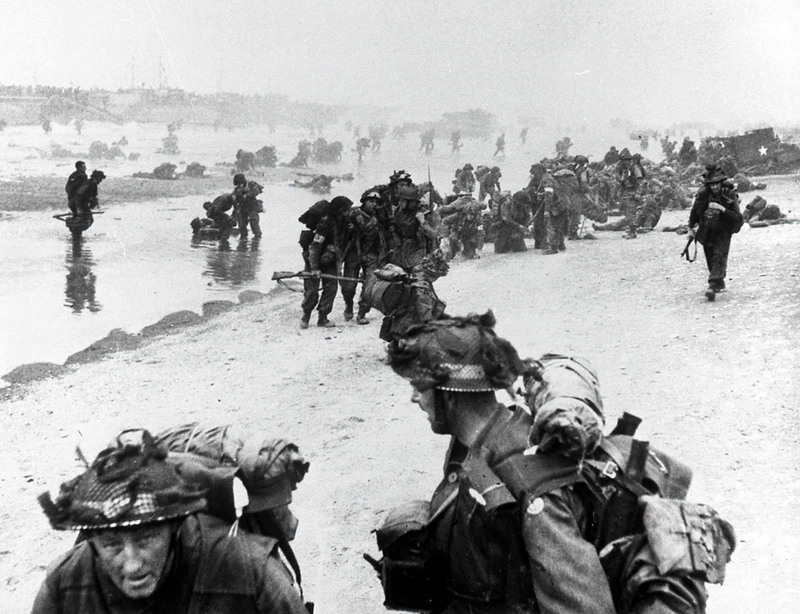 There is then a track along the centre of a landing craft, dwelling on the faces of the young soldiers as they are about to land on a beach. The shot of one of the soldiers mixes through to an image of a blurred figure running. A shot rings out and the figure crumples. The meaning of this is not clear at first but will become evident as the film develops. The central narrative begins with Tom, played by a young Brian Stirner, running up to his middle class home to say farewell to his parents and his pet dog. He catches a train to London but the train is delayed in an air raid. Archive footage of fireman battling with fierce blazes is intercut with Tom missing his rail connection and consequently arriving at his training camp late. He is soon inaugurated into the very different world of the army, with a bossy corporal who insists on everything being done to the letter and a bawling drill sergeant who screams orders at the poor recruits. The shots of Tom as he goes through Basic Training is, like the rest of the film, a combination of new material shot on an Aldershot parade ground for Overlord and archive footage from the IWM showing wartime recruits crossing rivers, climbing fences, and practising with bayonets. To make the joins between the specially shot material and the 30-year-old archive film look seamless, Cooper worked with cameraman John Alcott. Alcott was an English cinematographer who had worked with Stanley Kubrick on 2001: A Space Odyssey (1968) and A Clockwork Orange (1971), and would go on to win an Oscar for his photography of Barry Lindon in 1976. As an ex-photographer, Kubrick was a hard task-master for a cinematographer (see MHM 41 and 43) and Alcott had learned a lot from him. To make the old and the new footage match on Overlord, Alcott used old Kodak black and white 35mm film stock and German lenses from the 1940s. The IWM supplied the very best prints of their archive film, sometimes using the original nitrate prints with their wonderfully vivid resolution. The effect is magnificent. The moody black and white film moves smoothly from the dramatized scenes to superb archive imagery that looks as though it was specially shot for the movie. Frequently, one looks out for Tom and his colleagues in what turns out to be wartime archive film shot not by a feature film cinematographer but by army cameramen under combat conditions. While Tom goes through the trials of a being turned from a civilian into a soldier, the war gathers pace. The army was fighting limited campaigns in North Africa and then in Sicily and Italy, but the principal British war effort was the bombing offensive against Germany. Specially shot footage of a Lancaster taking off is intercut with archive film from actual night time bombing missions over Germany, with the cities below lit up as blazing infernos. 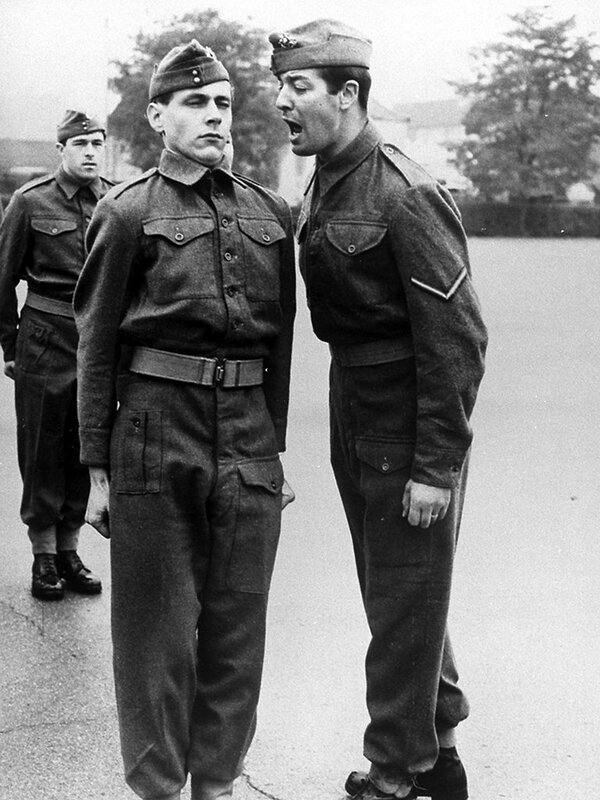 Time passes and Tom, along with his pals Arthur (Nicholas Ball) and Jack (Davyd Harries), are assigned to the East Yorkshire Regiment and are sent on final assault training for the invasion of Europe. IWM footage depicts endless lines of American troops arriving in Britain. 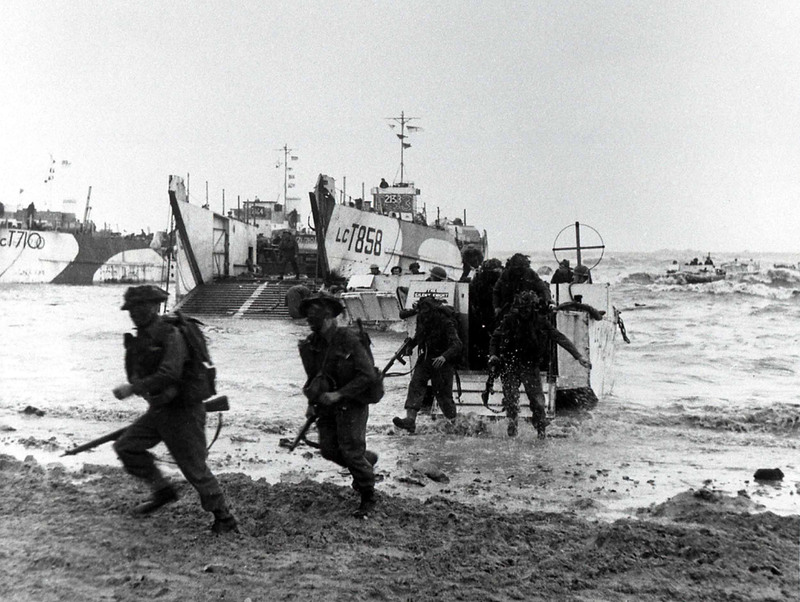 They rehearse embarking and disembarking from a variety of landing craft in extensive preparations for D-Day. The 79th Armoured Division under General Percy Hobart had developed tanks capable of a variety of tasks, better known as ‘Hobart’s Funnies’. One of ‘Hobart’s Funnies’, flail tanks were used to come ashore to clear the ground of mines. Archive film shows flail tanks coming ashore to clear the ground of mines. 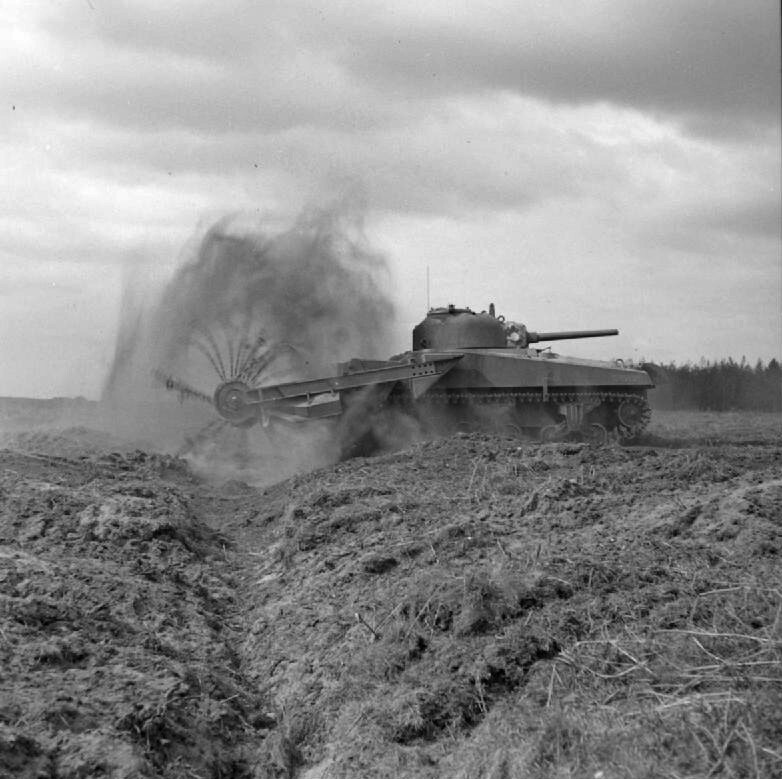 A track-laying tank lays a smooth surface to help other vehicles drive across the sandy beaches. The Giant Panjandrum is a huge Catherine-wheel powered by rockets to cross a beach and advance towards enemy strongholds. Sadly, the now famous footage of its trials shows it going hopelessly out of control and crashing just in front of the cameraman. Although unlike most movie sequences in which young soldiers meet girls, the naivety of this scene is probably more authentic to the experience of tens of thousands of inexperienced young men meeting future girlfriends. But in this case, the relationship is not allowed to flourish. Tom and his unit are posted away and are transported from one camp to another as they approach their final departure zone. To the sound of the George Formby song We don’t know where we’re going until we’re there (actually sung by soundalike Nick Curtis) there is a montage of shots filmed as southern Britain becomes a huge armed camp in May 1944 ready for the invasion of France. Tanks amass in vast numbers. The roads are filled with long lines of DUKWs heading for the coast. Pretty little villages are filled with lines of armoured vehicles as young boys look on in awe. Troops are gathered in final embarkation camps which are then sealed off. French currency is handed out and almost immediately gambled away. Officers show the men aerial photo-models of the beaches they will soon be landing on. All this archive material is from the IWM film collection and one of the joys of Overlord is seeing this fascinating and beautifully shot material presented so well. Every June, television companies from around the world send their researchers to copy footage of D-Day from the Film Archive at the IWM. They always seem to select the same few images that have been seen a hundred times before. But the IWM has tens of hours of outstanding imagery that never gets selected for television documentaries. And here is some of it, as good as feature film footage, showing the armies of Britain, the United States, Canada, and the others preparing for one of the biggest operations of the Second World War. It’s worth seeing Overlord just for this material alone, movingly edited by a brilliant television film editor, Jonathan Gili. While Tom reflects on his premonition of death, camera gun footage shows air-to-ground attacks of trains, trucks, and barges being strafed and rocketed in the final softening-up before the invasion. The men are told they must burn all their private letters or wrap them in special paper and send them home. Again archive film of this little known episode before D-Day is intercut with Tom throwing his letters onto a raging fire. ‘There,’ he ponders, ‘I’ve got nothing now. I’ve thrown it all way.’ It is like he is slimming down his life in anticipation of death. Chaotic scenes as Allied troops leave their landing crafts to face the German machine guns. The film intercuts shots of Tom’s body being removed from his craft with archive footage of dead and wounded soldiers being returned to Britain. In a final marvellous montage, long lines of men board their landing craft, vehicles and guns are reversed up ramps to be ready for landing, blacked up paratroopers board gliders as their tow-aircraft lumber down runways. The fleet moves out of the packed harbours of southern England. Ships signal and manoeuvre into position. The sun goes down as the invasion fleet assembles. The next morning Tom, Arthur, and Jack are in their landing craft. Nervously they await the moment when the craft hits the beach and the ramp goes down. Tom dreams of his girlfriend but she attends him as though in a mortuary. As the LCA moves in Tom raises his head to take a look at the beach. He is immediately hit by a machine gun bullet. In the pandemonium inside the craft, Jack and Arthur rush to him but he is dead, killed instantly by a random bullet in his head. Tom’s premonition has come true. But not as he had imagined it, heroically advancing into enemy territory. Tom’s death is a futile death. The ramp of the landing craft had not even gone down. There is no heroism in his end. The film concludes again with specially shot material of Tom being taken off the landing craft intercut with material of the dead and wounded being returned to Britain and of aerial shots of southern England. When Overlord was released in 1975 it attracted some favourable attention in Britain. And it was entered into the Berlin Film Festival where it won a Silver Bear Jury Prize. But it failed to find a distributor in the US. The film was too English, too underplayed. Not only was Tom too quiet and middle class to appeal to an American audience, but even as an anti-hero (and the mid-1970s was the era of anti-heroes) he did not chime with an American audience. It was 30 years until Janus Films ‘re-discovered’ Overlord and released it in the US in 2006, re-releasing it in Britain two years later. The New York Times said of Overlord that it ‘deserves to join the pantheon of essential WWII combat movies.’ The film had made it, at last. There is nothing epic about Overlord. It is the very opposite of The Longest Day with its mass of stars and full-on combat material. Its central narrative is slight and predictable from the start. However, it is unique not only as the IWM’s only ever venture into cinema production but for the resources the museum contributed to it. Genuine Second World War Lee Enfield rifles were loaned to the actors and the military extras to add realism. The film footage from the IWM film archive is genuinely fresh and different. It captures the build up of men and machines for the invasion in a way that no modern filming could ever hope to do without the use of extensive computer graphics. If Tom is the anti-hero of the movie, then the real heroes are the army, navy, and air force cameramen who recorded the original footage during 1944, shooting it so well that it sits perfectly alongside specially shot material taken thirty years later. We are lucky that the IWM has preserved this material so well and made it available for Overlord. And of course it is still there for future film makers to use again. Inspired by the Bayeux Tapestry, Lord Dulverton commissioned a Tapestry of the Allied invasion of northern Europe, Operation Overlord, in 1968. Sandra Lawrence designed the embroidery in 34 separate images and prepared watercolours based on photos for each of the panels. The Royal School of Needlework then prepared panels to be embroidered of each image and this took five years to complete. The Overlord Embroidery, as it became known, starts with the German invasion of France in 1940 and the London Blitz. It goes on to tell of America’s entry into the war and the build-up to D-Day two and a half years later. Most of the panels are devoted to crossing the Channel and the landings in Normandy. The last panel shows British troops advancing as German soldiers retreat across the Seine. The Overlord Embroidery is on permanent display at the Portsmouth D-Day Museum. The Imperial War Museum was founded in 1917 to collect and preserve material from the Great War, ranging from the fighting front to the home front, as a memorial to the wartime sacrifice. In 1920 it acquired 630 official films that had been made during the war and began the process of preserving these films for posterity, thus becoming the first public film archive in the world. After the Second World War the archive acquired all the record film that had been shot by the army, navy, and air force film units as well as the thousands of edited propaganda films made on every subject from short food flashes to epic compilations celebrating Allied victories. In the last 70 years the archive has continued to grow and now acquires video and digital material shot by the armed forces at home and abroad. The archive regularly works with television companies from around the world and its footage has featured prominently in series ranging from The Great War to The World at War, from Battle Stations to The Nazis: a warning from history. There is rarely an evening when a television channel somewhere is not showing a documentary that has been made using IWM footage. Director: Stuart Cooper. Producer: James Quinn. Screenplay: Christopher Hudson and Stuart Cooper. Photography: John Alcott. Editor: Jonathan Gili. Original Music: Paul Glass. Featuring: Brian Stirner at Tom, Nicholas Ball as Arthur, Davyd Harries as Jack and Julie Neesam as the Girl. Presented by the Imperial War Museum. Distributed by Janus Films. A Criterion Collection DVD.